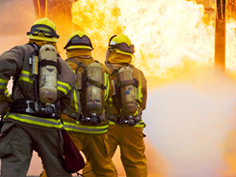 Hand portable extinguishers are considered the first line of defense for incipient fires in most homes and workplaces. Different sorts of fires require different effects, which are explained below. 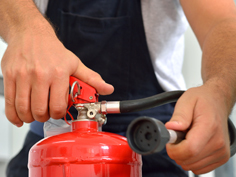 Stored pressure fire extinguishers are some of the most common on the market. In this type of extinguisher, the expellant is stored in the same chamber as the firefighting agent. ABC dry chemical extinguishers are the most frequently used types to extinguish many common fires. Suitable for use on flammable liquids and energized electrical equipment, BC dry chemical extinguishers are typically used in areas with liquid fuel fire hazards. Cartridge operated extinguishers contain the expellant gas in a separate cartridge that is punctured prior to discharge, exposing the propellant to the extinguishing agent. They typically provide a high rate of flow for dry chemicals, making them the tool of choice to meet demands of NFPA 10, section 5.5.1 and 5.5.3 for tough Class B fires, including pressure fires, gravity fed fires and obstacle fires. Cartridge fire extinguishers are Field Rechargeable, robust design, and have a Hi Flow rate of dry chemical to provide fire suppression power in the toughest applications. These units also have specialized powders available for hi risk fuel fires and Metal fires. Pressurized Water is used for Class A fires only. Do you need help selecting the appropriate extinguisher? Check out the chart below, or get in touch with us today. Water A Long 60 seconds Fights re-ignition by having a secondary cooling effect. 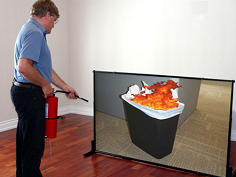 CO₂ B and C Short 10 - 20 seconds Asphyxiates fire; works best indoors in absence of wind. Some A Moderate 10 - 25 seconds The most common type of extinguisher; leaves residue. Specialty Powders D Met-L-X or others; good for hard-to-extinguish fires. Wet Chemical K Prevents re-ignition.